Overland Park is the second most populous city in the U.S. state of Kansas. Located in Johnson County, it is the second most populous city in the Kansas City metropolitan area. As of the 2010 census, the city population was 173,372; growing to 191,278 by 2017. It is home to the Sprint World Headquarters Campus. Overland Park traces its roots to 1905, with the arrival of its founder, William B. Strang Jr. who began to plot subdivisions along an old military roadway, which later became the city's principal thoroughfare. Strang developed large portions of what would later become downtown Overland Park. On May 20, 1960 Overland Park was officially incorporated as a "city of first class", with a population of 28,085. As in the case of hundreds of other suburban cities across the United States the following decades were incredibly successful. Less than thirty years later, the population had nearly quadrupled to 111,790 in 1990. While slowing somewhat, this growth rate continues on nearly three decades later, increasing to 173,250 as of the 2010 census. Overland Park officially became the second largest city in the state, following Wichita, Kansas, after passing Kansas City, Kansas in the early 2000s. Overland Park's success has not come without controversy though. Population growth in the city can mainly be attributed to the traditional greenfield suburban development. This pattern can be noted by viewing the city's annexation map. Overland Park's last annexation attempt in 2008, garnered widespread news coverage after massive outcry from affected residents. In total over 8 square miles (21 km2), though half of the 15 square miles (39 km2) the city originally requested, was added to the city. Overland Park now has a combined land area of 75.37 square miles (195.21 km2) and spans nearly the full North-South length of Johnson County. Though the outcry Overland Park caused lead state legislators to amend state laws governing annexations to require a majority vote of affected residents in all future annexations over 40 acres (0.16 km2). Overland Park was awarded “Best city to raise a family” and “One of the most popular cities for millenials” in 2018. Overland Park is located in northeastern Kansas at the junction of Interstate 435 and U.S. Route 69 immediately east of Olathe, the county seat. The city center is roughly 13 miles (21 km) south-southwest of downtown Kansas City, Missouri. According to the United States Census Bureau, the city has a total area of 75.37 square miles (195.21 km2) of which 74.84 square miles (193.83 km2) is land and 0.53 square mile (1.38 km²) is water. As a suburb of Kansas City, Overland Park is part of the Kansas City metropolitan area, and it borders other communities on all sides. These include Kansas City, Kansas, to the north, Mission and Prairie Village to the northeast, Leawood to the east, Stilwell to the south, Olathe and Lenexa to the west, and Shawnee and Merriam to the northwest. Most of Overland Park, specifically the part of it lying north of 159th Street, lies within the area of Johnson County referred to as Shawnee Mission. Overland Park lies in the transition zone between North America's humid subtropical climate and humid continental climate zones, typically experiencing hot, humid summers and cold, dry winters. The service sector constitutes most of the local economy. Health care, retail trade, professional and technical services, finance and insurance, and information technology are the city's five largest industries. Companies with headquarters in the city include Sprint Corporation, YRC Worldwide, Black & Veatch, Waddell & Reed, Ferrellgas, Ash Grove Cement Company, and Compass Minerals. The city seeks to attract technology companies in particular, such as Netsmart Technologies which relocated its headquarters there in 2011. Restaurant chain Applebee's was headquartered in the city from 1993 to 2007. It is also home to the Overland Park Xchange building, the 3rd largest office building in the Kansas City Metropolitan Area totalling 735,000 square feet of office space. As of 2014, 71.8% of the population over the age of 16 was in the labor force. 0.1% was in the armed forces, and 71.7% was in the civilian labor force with 68.1% being employed and 3.7% unemployed. The composition, by occupation, of the employed civilian labor force was: 53.0% in management, business, science, and arts; 26.2% in sales and office occupations; 11.3% in service occupations; 4.0% in natural resources, construction, and maintenance; 5.5% in production, transportation, and material moving. The three industries employing the largest percentages of the working civilian labor force were: educational services, health care, and social assistance (22.5%); professional, scientific, management, administrative, and waste management services (17.4%); and retail trade (10.7%). Sprint is the largest employer in the city followed by Shawnee Mission School District, Johnson County Community College, Blue Valley School District, Black & Veatch, OptumRx, the City of Overland Park, YRC Worldwide, Overland Park Regional Medical Center, and Waddell & Reed. The cost of living in Overland Park is below average; compared to a U.S. average of 100, the cost of living index for the city is 88.2. As of 2014, the median home value in the city was $225,000, the median selected monthly owner cost was $1,712 for housing units with a mortgage and $570 for those without, and the median gross rent was $974. Overland Park lies within Kansas's 3rd U.S. Congressional District, which is represented by Sharice Davids. For the purposes of representation in the Kansas Legislature, the city is located in the 6th through 8th, 10th, 11th, 21st, and 37th districts of the Kansas Senate and the 8th, 16th, 19th through 24th, 27th through 29th, and 48th districts of the Kansas House of Representatives. The Overland Park Police Department (Kansas) is the main agency to patrol all of Overland Park with the Johnson County Sheriff's Office also assisting with serving papers and other court documents to people who work in the city as well as patrolling the unincorporated parts of the county and other cities in the county. OPPD has 310 full-time employees and 255 commissioned personnel. The current police chief is Frank Donchez. Overland Park spans four public school districts. The portion of the city north of Interstate 435 lies within the Shawnee Mission School District (SMSD). SMSD, which is headquartered in Overland Park, operates thirty eight elementary schools, two middle schools, six high schools, and multiple support facilities in the city. Most of the city south of I-435 lies within the Blue Valley School District. Blue Valley, also based in Overland Park, operates 20 elementary schools, nine middle schools, five high schools, and one alternative high school in the city. A portion of western Overland Park lies within the Olathe Public Schools district which operates two elementary schools in the city. The extreme southwestern part of Overland Park lies within the Spring Hill School District. Kansas City Japanese School Inc. (カンザスシティ日本語補習授業校 Kanzasu Shiti Nihongo Hoshū Jugyō Kō), a Japanese weekend educational program, is held at the Kansas Christian College in Overland Park. First established 1979, it was formally approved by the Japanese Ministry of Education (Monbusho) and officially established in 1984. The Accreditation Council for Business Schools and Programs is based in Overland Park; its competitive peer, the International Assembly for Collegiate Business Education, is based in neighboring Lenexa. Interstate 435, the Kansas City area's beltway, and U.S. Route 50 run concurrently east–west through central Overland Park. Interstate 35 runs northeast–southwest through the city's northwestern and northern fringe. U.S. Route 56 and U.S. Route 169 run concurrently with I-35 through the city's northwestern fringe and then split off to the east as Shawnee Mission Parkway at interchange 226, running east–west through northern Overland Park. U.S. Route 69 runs generally north–south through the city, merging with I-35, U.S. 56, and U.S. 169 at interchange 225 just northwest of the city. U.S. 69 then splits off to the east with U.S. 56 and U.S. 169 as Shawnee Mission Parkway before turning north again as Metcalf Avenue. In extreme northern Overland Park, U.S. 69 then re-merges with I-35. Metcalf Avenue continues north out of the city as Interstate 635. Kansas City Power and Light (KCP&L) provides electric power. Google Fiber, AT&T, Time Warner Cable, and Consolidated Communications offer cable television, landline telephone, and broadband internet service. Local residents predominantly use natural gas for heating fuel; utility gas service is provided by Atmos Energy and Kansas Gas Service. WaterOne, an independent public utility, oversees water provision, distribution, and infrastructure maintenance. The Johnson County Wastewater department manages waste water collection, transportation, and treatment. Multiple privately owned trash haulers, evaluated and given permits by the city government, offer trash removal and recycling service. Overland Park has more than 1,800 acres (7.3 km2) of park land and open space. The city's 72 parks offer public golf, sand volleyball, hiking and biking trails, playgrounds, tennis courts, basketball courts, and reservable shelters. 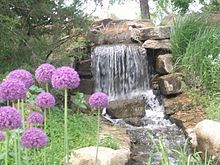 Waterfall and Flowers at the Overland Park Arboretum and Botanical Gardens. The city is home to Overland Park Arboretum and Botanical Gardens, a 300 acres (120 ha) arboretum and botanical garden. The Oak Park Mall is one of the area's top shopping locations with nearly 200 stores. Continuing development in the Corbin Park area has added more stores and restaurants. The Johnson County Arts and Heritage Center houses the Johnson County Museum, KidScape, resident theatre company Theatre in the Park, a fine arts program, an emerging arts program, and the Overland Park Historical Society. The Deanna Rose Children's Farmstead is a 12-acre (49,000 m2) farm with animals, hay rides, a fishing pond, an early 1900s school house, and a children's gold mining camp. The Overland Park Golf Division operates two public golf courses: St. Andrews Golf Club and the Sykes Lady Golf Club. These courses host more than 130,000 rounds of golf a year. Scheels Overland Park Soccer Complex was named the top soccer facility in the nation by Livability because it is considered the only complex of its kind in the United States. It covers 96 acres (39 ha) and offers 12 lighted, regulation size synthetic, turf fields with a cooling system to control turf temperature on hot days. In 2015, Topgolf driving range and entertainment complex opened in Overland Park. It offers a driving range, bar, and restaurant complex, and employs more than 450 people. Historic Downtown Overland Park contains a farmers' market, the clocktower plaza and a statue of Overland Park City founder William B. Strang Jr. It also hosts the Strang Carriage House and is home to the Overland Park Historical Society. The city has numerous public art works installed under the Public Art Program. Overland Park is highly populated by Protestants, reflective of the overall population of the state of Kansas. Large Baptist, Methodist, Nazarene and Pentecostal churches dot the landscape of Overland Park as well as its neighboring suburbs. Overland Park is also home to a relatively small Muslim population. The Islamic Center of Johnson County serves as a mosque and a community center for Muslims in Overland Park. There is also a growing Hindu, Sikh, and Buddhist population in Overland Park and surrounding areas. Overland Park is also served by a number of synagogues: Congregation Beth Israel Abraham Voliner, an Orthodox synagogue established in Kansas City, Missouri, in 1894. Other Orthodox synagogues include the Chabad House Center which serves as the Chabad Headquarters for Kansas and Missouri, and the Torah Learning Center. There are several other synagogues, too, including Kehilath Israel, Congregation Beth Torah, and The Temple, Congregation B'nai Jehudah. Also, Overland Park is home to a significant number of Roman Catholics. Overland Park falls within the boundaries of the Archdiocese of Kansas City in Kansas. Parishes such as St. Michael the Archangel, Holy Cross, Holy Spirit, Ascension and Queen of the Holy Rosary serve Catholics in Overland Park. Holy Cross offers a Spanish mass for the Hispanic community in the city. The city has developed a positive reputation in American media as an affordable and family-friendly community. CNNMoney.com has consistently ranked Overland Park in the top 10 of its 100 Best Places to Live in the United States. In 2015 Forbes ranked the city among the 25 Best Suburbs for retirement. In 2015 Overland Park was named No 1 in the nation for "Top 10 Best Cities for Families". It was also recognized as No. 15 for "America's 50 Best Cities to Live " by 24/7 Wall Street. Overland Park was also awarded the No. 1 city in the country for first time home buyers in 2015 by WalletHub citing its low crime rate and outstanding schools. BusinessWeek ranked the city as one of "The Best Places to Raise Your Kids", and U.S. News & World Report ranked it among "America's 10 Best Places to Grow Up". In 2014, Housing Wire ranked Overland Park number three in its list of "The 10 absolute best housing markets for families". Overland Park was the setting of the 2008 documentary series High School Confidential and the 2009–2011 television series, United States of Tara. It is also the setting of the popular web series The Most Popular Girls in School. ^ "Mayor Carl Gerlach". City of Overland Park. Retrieved 10 September 2010. ^ a b c "American FactFinder". United States Census Bureau. Retrieved 2016-07-25. ^ "Overland Park At-A-Glance". City of Overland Park. Retrieved 2014-06-04. ^ a b c d e f g "American FactFinder 2". United States Census Bureau. Retrieved 2011-12-06. ^ "U.S. Census Bureau QuickFacts: Overland Park city, Kansas". Census Bureau QuickFacts. Retrieved 2018-06-27. ^ "Military Road to Metcalf". Overland Park Historical Society. Retrieved 2018-04-14. ^ "Rails to Suburbia 1900". Overland Park Historical Society. Retrieved 2018-04-14. ^ "U.S. Census Bureau QuickFacts: Overland Park city, Kansas". www.census.gov. Retrieved 2018-04-14. ^ "Printable Maps – City of Overland Park, Kansas". www.opkansas.org. Retrieved 2018-04-14. ^ Ziegler, Laura. "Overland Park Annexation Opponents Plan Appeal". Retrieved 2018-04-14. ^ Mo., Jim Sullinger/The Kansas City Star,. "Overland Park annexation debate heats up". LakeExpo.com. Retrieved 2018-04-14. ^ "Lawmakers limit cities' annexation power". kansas. Retrieved 2018-04-14. ^ Maria Sudekum, Jim Suhr (2014-04-13). "Kansas Shooting Suspect Had No Record of Violence - ABC News". Abcnews.go.com. Retrieved 2014-04-23. ^ "3 killed in shootings at Kansas City-area Jewish centers". CNN.com. Retrieved 2014-04-23. ^ Maria Sudekum (2014-04-14). "Supremacist ID'd as suspect in Kansas attacks". SFGate. Retrieved 2014-04-23. ^ "Kansas Jewish Center Shooting Suspect Identified as Former KKK Leader - ABC News". Abcnews.go.com. 2014-04-13. Retrieved 2014-04-23. ^ a b "2003-2004 Official Transportation Map" (PDF). Kansas Department of Transportation. 2003. Retrieved 2011-12-06. ^ a b c "General Highway Map - Johnson County, Kansas" (PDF). Kansas Department of Transportation. July 2010. Retrieved 2011-12-06. ^ "ZIP Code Lookup". United States Postal Service. Retrieved 2013-05-01. ^ "Shawnee Mission Zip Code Map". MapsZipcode. Retrieved 2013-05-01. ^ "Population Estimates". United States Census Bureau. Archived from the original on July 14, 2016. Retrieved May 30, 2016. ^ "OMB Bulletin No. 13-01" (PDF). Office of Management and Budget. 2013-02-28. Retrieved 2014-06-04. ^ "Industry Clusters". Overland Park Chamber of Commerce Economic Development Council. Retrieved 2013-06-02. ^ a b "Leading Employers". Overland Park Chamber of Commerce Economic Development Council. Retrieved 2013-06-03. ^ Raletz, Alyson (February 17, 2012). "Netsmart Technologies picks Overland Park for new headquarters". Kansas City Business Journal. ^ Collison, Kevin (2011-05-28). "Applebee's to move headquarters, 390 jobs to Kansas City, Mo. from Lenexa". The Wichita Eagle. Retrieved 2013-06-02. ^ a b c d "Overland Park, Kansas". City-Data.com. Retrieved 2016-07-25. ^ "Grandview 2015 Comprehensive Annual Financial Report" (PDF). Retrieved February 26, 2017. ^ a b c "Overland Park". Directory of Kansas Public Officials. The League of Kansas Municipalities. Retrieved 2013-04-30. ^ a b c "City Manager's Office". City of Overland Park. Retrieved 2013-04-30. ^ a b "City Council". City of Overland Park. Retrieved 2013-04-30. ^ a b "Mayor's Office". City of Overland Park. Retrieved 2013-04-30. ^ a b c d "Johnson County Online Mapping". Johnson County, Kansas. Retrieved 2014-06-27. ^ "Schools". Shawnee Mission School District. Retrieved 2014-06-27. ^ "School Sites". Blue Valley School District. Retrieved 2014-06-27. ^ "School Directory". Olathe Public Schools. Retrieved 2014-06-27. ^ "Schools". City of Overland Park. Retrieved 2014-06-27. ^ "Explore our Catholic schools!". Roman Catholic Archdiocese of Kansas City in Kansas. Retrieved 2014-06-27. ^ "About Bethany". Bethany Lutheran School. Retrieved 2014-06-27. ^ "Welcome". Christ Lutheran School. Retrieved 2014-06-27. ^ "Mount Olive Lutheran School". Mount Olive Lutheran School. Retrieved 2014-06-27. ^ "Our Campuses". Kansas City Christian School. Retrieved 2014-06-27. ^ "Overland Christian Schools". Overland Christian Schools. Retrieved 2014-06-27. ^ "Welcome". Hyman Brand Hebrew Academy. Retrieved 2014-06-27. ^ "Accelerated Schools of Overland Park History". Accelerated Schools of Overland Park. Retrieved 2014-06-27. ^ "北米の補習授業校一覧（平成25年4月15日現在）." () MEXT. Retrieved on May 5, 2014. "c/o Kansas Christian College, 7401 Metcalf Ave, Overland Park, KS 66204, U.S.A."
^ "About Our School" (Archive). Kansas City Japanese School, Inc. Retrieved on April 5, 2015. ^ a b c d "Overland Park, KS". Google Maps. Retrieved 2014-06-26. ^ "System Map" (PDF). Johnson County Transit. Retrieved 2014-06-26. ^ "KOJC - Johnson County Executive Airport". AirNav.com. Retrieved 2014-06-26. ^ a b "Utilities". City of Overland Park. Retrieved 2014-06-26. ^ "Our Story". WaterOne. Retrieved 2014-06-26. ^ "Wastewater". Johnson County, Kansas. Retrieved 2014-06-26. ^ "Trash Haulers/Disposal". City of Overland Park. Retrieved 2014-06-26. ^ "Best Hospitals - Find Hospitals". U.S. News & World Report. Archived from the original on 2016-07-17. Retrieved 2014-06-26. ^ "Overland Park: Communications". City-Data.com. Retrieved 2013-08-03. ^ "Record Details - Campus Ledger". Kansas Press Association. Retrieved 2013-08-03. ^ "Record Details - Kansas City Nursing News". Kansas Press Association. Retrieved 2013-08-03. ^ "2009 Arbitron Radio Metro Map" (PDF). Arbitron. Archived from the original (PDF) on 2011-07-20. Retrieved 2013-08-03. ^ "Kansas City [TV Market Map]". EchoStar Knowledge Base. Retrieved 2013-08-03. ^ "Radio Stations in Overland Park, Kansas". Radio-locator. Retrieved 2013-08-03. ^ "Kansas City 760 AM / 92.3 FM / 88.9 FM, 101.5 FM". Bott Radio Network. Retrieved 2013-08-03. ^ "About BRN". Bott Radio Network. Retrieved 2013-08-03. ^ "Johnson County Kansas Museum". Johnson County Park & Recreation District. Retrieved February 8, 2018. ^ "Best Places to Live - Top 100". CNNMoney.com. Retrieved 2013-04-23. ^ "Overland Park". The Best Places to Raise Your Kids 2009. Bloomberg Businessweek. Retrieved 2013-04-23. ^ Mullins, Luke (2009-08-19). "America's 10 Best Places to Grow Up". U.S. News & World Report. Retrieved 2013-04-23. ^ Garrison, Troy (2014-06-10). "The 10 absolute best housing markets for families". Housing Wire. Retrieved 2014-06-26. ^ "High School Confidential". IMDb. Retrieved 2013-04-23. ^ "Overland Park, KS". 6-figure towns. CNNMoney.com. 2009-07-21. Retrieved 2013-04-23. Wikimedia Commons has media related to Overland Park, Kansas.